Binding: Print version: 600+ pages, comb bound. Order the free PDF above (no credit card required). Download the free PDF through this link, which will take you to the Legal Document Library. 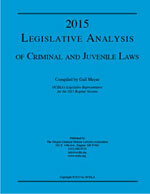 There, the 2015 Legislative Analysis is included under the Legislative Analysis category.